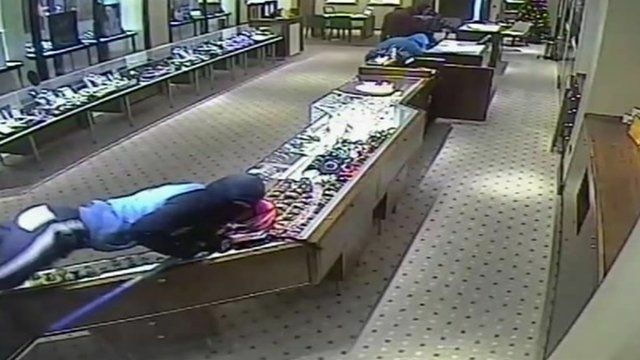 CCTV footage of raiders breaking into an Oxford city centre jewellery shop has been released by police. Seven men smashed their way into the Clarendon Centre and forced open the shutters on Goldsmiths Jewellers in the early hours of 31 December. Four others fixed a steel wire across both ends of Queen Street to stop vehicles getting through. The value of a quantity of watches stolen has not been disclosed. Thames Valley Police renewed an appeal for information on what officers described as a "well planned and executed crime".